Thum! Kaun Aata Hai? 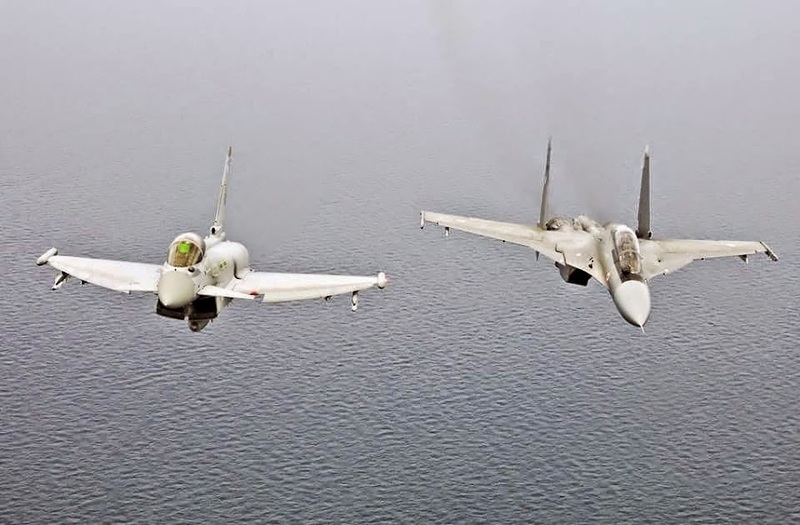 : Su-30MKI vs Eurofighter Typhoon - The Truth is Nuanced, but the Brits Won't Like it Anyway! Su-30MKI vs Eurofighter Typhoon - The Truth is Nuanced, but the Brits Won't Like it Anyway! Did the Su-30MKI outmaneuver the Eurofighter Typhoon 12-0 within visual range (WVR) combat during Indradhanush 4, as stated by Group Captain Ashu Srivastav, who led the IAF Indradhanush-4 detachment to RAF Coningsby, to NDTV? Certainly, yes! IAF pilots are not inclined to make false claims, or indulge in wanton exaggerate. Does that mean the Su-30MKI is superior to the Typhoon in aerial combat? Certainly, not! Aerial combat is replete with factors - ponderable and imponderable - that change its outcome. It does not fit a True or False scenario. The response to a question such as which aircraft is better in combat has got to be nuanced. Ashu Srivastav's inputs to NDTV were precise and very professional. He said that the IAF Su-30MKI aircrew outperformed RAF Typhoon pilots in 1 vs 1 and 2 vs 1 WVR combat using close combat missiles (CCM) within a range of two miles. 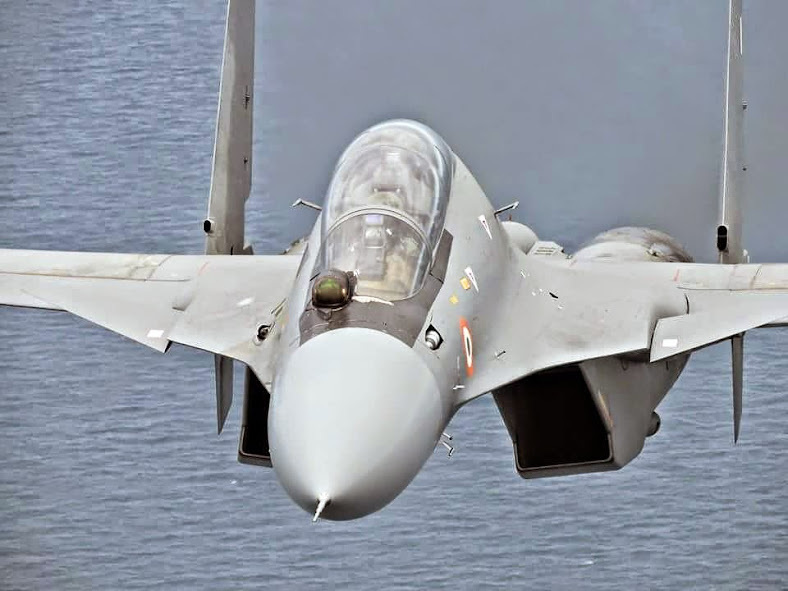 The CCM restriction implied that the engagements involved low energy combat, a flight envelope in which the Su-30MKI excels because of thrust vectoring. An unnamed RAF source quoted by The Independent has countered Ashu Srivastav's statement saying, "There must have been some clouded recollection on the flights back to India. The headlines of the Indian press bear no relation to the results of the tactical scenarios completed on the exercise in any shape or form." The response lacks precision and is characteristic of British vagueness and verbosity that gets accentuated in the face of embarrassing truths. The Independent source went on to say, "The Su-30MKI is one of the aircraft that the Typhoon was designed to tackle and defeat, and no doubt in the right hands would present a potent challenge. Today [though] the aim would be to engage aircraft like the Su-30MKI from long-range before the two could come together in a dogfight." The second statement by the RAF source is on the mark, just as Ashu Srivastav's 12-0 victory claim is on the mark. A quick comparison of the Su-30MKI and Eurofighter Typhoon combat capabilities should put the apparently contradictory claims in the correct perspective. Su-30MKI excels in WVR low energy combat because of thrust vectoring. The Typhoon outperforms the Su-30MKI in high energy WVR combat because of its better thrust to weight ratio and high speed turn performance. Its Captor M radar emissions are more difficult to detect, track and spoof than those of the Su-30MKIs BARS radar. Its Attack and Identification System (AIS) provides better situational awareness and threat handling. It has a significantly smaller radar signature than the Su-30MKI. 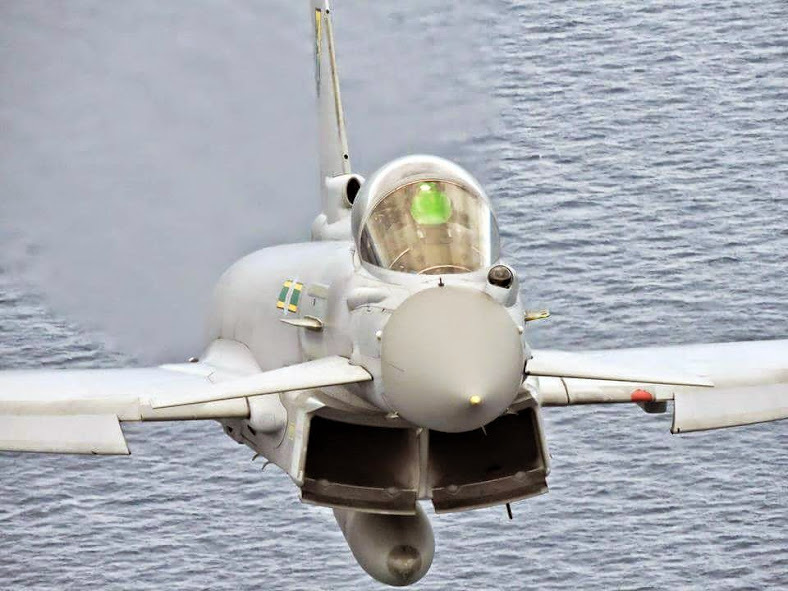 Typhoon's AIS includes sensor fusion wherein data from multiple sensors - the fighter's Captor radar, PIRATE Infrared Search and Track System (IRST) and EW suite, as well as off-board radars (AWACS, ASTOR, JSTARS, even other Typhoons) over datalink - is displayed on a single MFD, reducing pilot workload and confusion. AIS automatically exercises Captor radar emissions control (EMCON) based on the composite threat scenario. The Su-30MKI doesn't feature AIS and sensor fusion, but has a weapon system operators to monitor and act upon inputs from on and off board sensors. A man in the loop can add value, or confusion depending on the training and emotional state, as well as the complexity of the threat scenario. Because of its significantly larger size, the Su-30MKI has a bigger radar signature. The larger cross-sectional area of the fuselage in front of the cockpit allows the Su-30MKI to carry a more powerful radar, but the high radiated energy of the radar allows it to be passively detected and identified at longer ranges giving the adversary an advantage. In view of the above, here is how a Typhoon pilot would engage an adversary Su-30MKI in war. The Typhoon pilot would attempt to leverage to the hilt his aircraft's superior BVR combat capability. He would keep his CAPTOR radar on automatic EMCON and focus on passively tracking a Su-30MKI using its BARS radar emission, or in case the Su-30MKIs BARS was switched off, an offboard radar. A Typhoon could track a Su-30MKI with a radiating radar from 300-km. A Su-30MKI with its radar switched off could be tracked from around 180-km using AWACS data link. When in range, the Typhoon would engage the Su-30MKI with BVR missiles. Adversary Su-30MKI would remain oblivious to the presence of the Typhoon till he sees the missile coming at him! In case initial BVR missile engagements are thwarted by Su-30MKI jamming or decoys, the Typhoon would try and acquire the adversary Su-30MKI on his PIRATE IRST and use his BVR missiles. Close to a merge, the Typhoon would disengage and getaway, choosing to fight another day. When faced with adversary Typhoons, a Su-30MKI pilot would keep his BARS switched off and rely almost exclusively on an off-board radar (AWACS or another radiating Su-30MKI) to passively track the Typhoon and engage it with its BVR missiles. If BVR missiles fail to score, he would keep closing in to a range where his IRST picks up the Typhoon, and then take more shots at the Typhoon. The Typhoon's ability to automatically fuse inputs from multiple sensors would facilitate more accurate tracking of the target and guidance of the BVR missile, giving the Typhoon a definite advantage over the Su-30MKI during BVR combat. Because of the Su-30MKI's bigger radar signature, an AWACS supporting the Typhoon would pick up the Su-30MKI before the AWACS supporting the Su-30MKI picked up the Typhoon. This would give the Typhoon more advantage. Without AWACS on both sides, IRST detection ranges will prove critical to the outcome of the combat. With AWACS, the game will be one sided in favor of the Typhoon till IRST pickups. In case of a merge and WVR combat, the game will rapidly become one sided in favor of Su-30MKI. What we have looked at is a 1 vs 1 scenario. In real life air-combat tends to be a melee. If the BVR engagements are ineffective due to EW and other countermeasures, there will be accidental merges galore, whether the Typhoon pilots like it or not! The question really is - How effective would be BVR engagements between two well trained adversaries in the prevailing scenario? The Su-30MKI's IRST reportedly proved to be a distinct advantage for IAF aircrew during WVR combat during Indradhanush-4. It appears that IAF aircrew used their IRSTs more than their eyeballs to track their adversary while maneuvering in WVR combat, which helped them avoid the pitfall of bleeding energy levels excessively, as they reportedly did during the last Red Flag exercise. A training exercise such as Indradhanush is aimed at improving pilot skills. It would involve some leveling of the playing field so as to keep the focus on skill development. For example, it could be assumed that both the sides have close combat missiles with similar off bore-sight capability. Missile capabilities - CCM or BVR - differ. In a war the outcome of an aerial combat would depend a lot on weapon systems employed, in addition to aircraft capability and pilot skills. Su-30MKI excels in WVR low energy combat, Typhoon in standoff & WVR high energy combat. The equation could be significantly altered by EW surprises, giving an adversary temporary advantage. AWACS backed IAF Su-30MKIs adhering to strict EMCON could negate some Typhoon BVR combat advantages, but overall the Typhoon is a better BVR combat aircraft. The IAF Su-30MKI have regained a lot of the respect that it lost in Indradhanush 3 and the last Red Flag exercise in the US. It appears that the IAF has put in a lot of thought and training to regain confidence in the Su-30MKI.